Chemistry: Na4(Al, Si)12O24Cl to Ca4(Si, Al)12O24(CO3, SO4) , Calcium Sodium Aluminum Silicate Carbonate Chloride Sulfate. Uses: As gemstones and as mineral specimens. Scapolite is actually the name of a series between the sodium chloride rich mineral called marialite and the calcium carbonate rich mineral meionite. 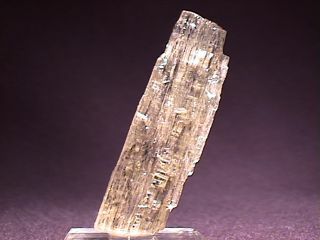 The structure of scapolite is similar to some feldspathoids in that it is composed of large open spaces in the framework of silicate and aluminum tetrahedrons. These open spaces are large enough to essentially cage the very large ionic groups of either Na4Cl or Ca4CO3. The sulfate ion shown in the formula is typically barely more than a trace, but is found in far greater percentages than the occasional fluorine or hydroxide interlopers in the scapolite structure. Scapolite forms in metamorphic rocks from the alteration of plagioclase feldspars. The entire scapolite series is analogous to the plagioclase series. If the formula of marialite is written as 3(Na(Al, Si)4O8)NaCl it is clear how well it matches the formula of the sodium rich plagioclase, albite, NaAlSi3O8. A similar look at meionite's formula, 3(Ca(Al, Si)4O8)CaCO3, shows that it too is near three times the formula of anorthite, CaAl2Si2O8. The addition of the extra sodium chloride or calcium carbonate occurs during metamorphism as well as substantial alteration of the structure. Although nearly pure albite and anorthite specimens are sometimes found, pure forms of meionite and marialite are unknown of in nature. Distinguishing the scapolite minerals from each other is difficult as they differ only slightly in density and index of refraction, increasing in both with increasing calcium content. It is because of this closeness in properties and yet seemingly very different chemistries that scapolite has had its share of pseudonyms. Wernerite was the most common alternate name for the scapolite series, but now it has mostly disappeared from use. A few other names such as mizzonite and dipyre as well as marialite and meionite have been used as names for the entire scapolite series. Now scapolite is a name recognized by most every mineralogist and rock hound the world over. Scapolite, which is Greek for "shaft", is commonly found in stubby to long prismatic crystals, hence the name. It is tetragonal so that it will commonly have a square or octahedral cross-section. It belongs to a rather exclusive symmetry class that is shared by only two other well known minerals, powellite and scheelite. The symmetry class is called the Tetragonal Dipyramidal Class and is characterized by only having the one primary four fold axis of rotation and a perpendicular mirror plane, denoted as 4/m. Unfortunately, scapolite rarely forms crystals with the complex faces that would be needed to see this unusual symmetry. As a gemstone scapolite is not well known, but can be very attractive. The color of its gemstones, which is usually a nice yellow to orange, pink or violet, is its best feature as its fire and hardness are somewhat lacking. Less transparent material can often be cut as cabochons that will often exhibit a good Cat's Eye effect or if the "Cat's Eye" is not distinct enough it will show a play of light similar to Moonstone. Color is most commonly white, colorless, greenish or gray but also yellow, brown, reddish, pink, violet or blue colors are possible. Luster is vitreous on freshly exposed crystals or surfaces but weathering causes a dulling of the luster. Transparency: Crystals are translucent to transparent. Crystal Habits include prismatic to stocky crystals terminated by a pyramid. Complete crystals are rare and often the crystals will have distorted shapes with uneven faces. Cleavage is distinct in several prismatic directions producing a splintery almost fibrous appearance in cleaved massive specimens. Fracture is subconchoidal to uneven. Other Characteristics: Will often fluoresce either orange, yellow or more rarely red under ultraviolet light and index of refraction varies from 1.54 to 1.60. Associated Minerals include hornblende, the garnet minerals almandine and andradite, actinolite, microcline, pyroxenes, apatite, andalusite, zircon, sphene, diopside and muscovite. Notable Occurrences include Renfrow Co., Ontario; Franklin, New Jersey, Massachusetts and St Lawrence Co., New York, USA; Arendel, Norway; Mount Vesuvius, Italy and Mexico. Gemstone sources are found in Minas Gerias, Brazil; Madagascar, Tremorgio, Switzerland and Burma. Best Field Indicators include color, crystal habit, cleavage surface features, fluorescence and hardness.